With the help of two volunteers from the audience the magician attempts to demonstrate how to juggle with large metal rings. But, before he even starts the rings start linking mysteriously. Involving the volunteers throughout, the rings keep joining onto one another until the hapless entertainer has to eventually give up as the rings have now been made into one long chain. Yes, you've guessed it - it's a linking ring routine. 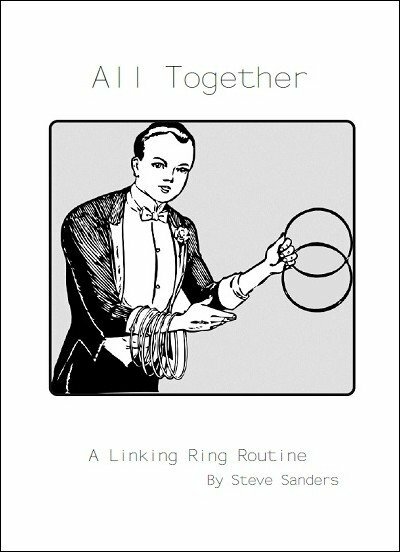 After getting a set of eight linking rings Steve was surprised at the number of routines that do not use eight! So, wanting to get his money's worth he decided to create a routine that used them all. It started with the premise that the rings should link together one after each other, until they are all linked in one long chain. Admittedly the routine only manages to link seven, but we can't have everything. It's been a regular feature of his act for over ten years now, so it is very practical. However, with all such things, it does need a a bit of practice.